A versatile and highly adaptable voice processing system, VocalSynth 2 sounds and operates better than ever. Much more control via Advanced view, particularly over the synth engine. Talks to Neutron 2 and Ozone 8. Onboard synth engine is still comparatively limited. When we reviewed iZotope’s multidimensional vocal transformation effect plugin, VocalSynth, we scored it 4/5, summing it up as “an extremely convenient option that’s definitely worth checking out”, but suggesting that its simplicity could be a limitation as well as a selling point. 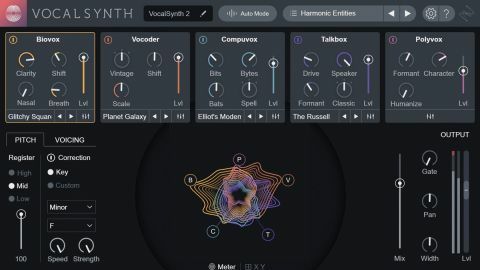 With v2, the Cambridge, MA-based developers have upped VocalSynth’s game by adding a few new strings to its architectural bow and giving the user a lot more control over the whole thing. In fundamental terms, VocalSynth 2 (VST/AU/ AAX; $79 upgrade from v1) presents the same proposition as its predecessor. The input signal (a vocal, natch) starts its journey at the optional Pitch Correction section, before hitting a parallel bank of synthesis-based processing modules, the mixed output of which is fed into a chain of stompbox-style effects and ultimately blended back in with the dry signal. Most of the modules (Vocoder, Compuvox, Talkbox and the new Biovox) involve the input signal modulating their onboard carrier synths in Auto mode, or an externally generated audio signal in Sidechain mode. The internal synths track the input signal for pitch, with the intervals of up to three extra stacked voices defined in the Voicing section. The remaining module, Polyvox, generates harmonies, pitched using the same Voicing controls. Alternatively, you can play the internal synths and Polyvox’s harmonies via MIDI input. That’s the overview, then, so let’s get into the new stuff. First, the GUI has been redesigned to match the style of iZotope’s other recent releases. It looks great and is admirably easy to navigate. While we love the eye candy of the new Anemone visualiser, though, which shows the effect of each module “based on Mel Frequency Cepstral Coefficients calculations” and serves as a level mixer, the actual information it relays isn’t all that useful. The original Wave Meter is still onboard, however, reinstated via the Options menu; or the whole panel can be turned over to the XY controller. The aforementioned new Biovox module models the human vocal tract, offering control over its length (formant Shift), Nasality and Breathiness. The Clarity knob alters the balance between the carrier synth signal and the vocal, affecting verbal intelligibility. Opening Biovox’s Advanced view (see below) reveals the Vowel pad, which pulls the sound towards a specified blend of vowels. It certainly works, but given how profound and sweeping the effect is, it’s most effective as a corrective automation target, for spot-fixing unclear individual vowels. Overall, Biovox is a solid new addition to VocalSynth’s module rack. The second big new feature directly addresses one of our complaints about version 1. Every module now has a drop-down Advanced view that fills the centre strip of the interface, replacing the Pitch/Voicing and Output sections, and visualiser, and giving access to a range of previously behind-the-scenes parameters. The actual contents of the panel vary from module to module, although all five have a pan control - yes, you can now pan modules independently - and combination high/low-pass filter. That’s actually all you get with Polyvox, but the other four now let you go to town with the oscillator and modulation settings of their synth engines. VocalSynth’s board of serial stompbox effects can now be freely configured by dragging them left and right, and has been expanded from Distort, Transform, Filter, Shred and Delay to seven in total, thanks to the addition of the new Chorus and Ring Mod devices. Chorus is as simple as choruses get, with controls for LFO Rate (0.1-5Hz) and Depth, stereo Width and dry/wet Mix. It gets the job done and sounds fine. Ring Mod is a ring modulator that can be called on for the harsh, metallic effects one associates with the process, or - at very low modulation frequencies, the range being 1-8000Hz - a rather heavy-handed tremolo. The onboard triangle-wave LFO wobbles at up to 30Hz and is depth-adjustable, and both modulation and LFO frequencies are syncable to host tempo at note values from 4/1 to 1/64. This certainly isn’t an effect for delicate vocal sweetening, but for radical, aggressive treatments, it’s stellar. The audio slice-repeating Shred effect has seen an upgrade, too, with a new engine and the integration of a groovy three-step sequencer. Eight Sequence presets set the timing of travel through the three steps, each of which has its own repeat rate for far madder slicing tricks than were previously possible. Each synth comprises two analogue-style Oscillators and a Noise oscillator, plus an LFO that can be applied to pitch, wave shape morphing (PWM, triangle-saw morphing, seven-saw unison stacking, etc), and Noise oscillator aliasing (Crush, also modulatable by pitch). A library of synth presets is included, and you can, of course, add to it with your own patches. The ability to get hands-on with the synths obviously marks a major improvement on the original VocalSynth’s entirely uneditable carrier setup, and we’re very glad to see it implemented. No matter how much you tweak those engines, though, much of the time you’ll still, unsurprisingly, get better results using a more full-on external synth as the carrier in Sidechain mode, particularly with Vocoder. Beyond that, Biovox’s Advanced view also houses its Vowel pad, while Vocoder’s exposes Volume and, interestingly, Pan sliders for its frequency bands (8, 10 or 11, depending on the Vocoder Mode). Control of Vocoder band volume should really have been in place for version 1, so this is a very welcome addition, while the Pan controls ice the cake nicely. Finally, VocalSynth 2 features “inter-plugin communication”, via which it shows up as a signal/channel in iZotope Neutron 2’s Masking Meter and Visual Mixer, and the Tonal Balance Control plugin included with Neutron 2 and Ozone 8. Handy for those so equipped. VocalSynth was already a fantastic plugin, with endless potential for harmonising, mechanising, monsterising, enhancing, replacing and general transmogrification, and version 2 brings plenty of impressive new toys to the table. Most notably, Biovox, the Advanced view and the new effects make it far more versatile than before; and while the onboard synth engine is still a bit of a soft spot, at least we can now program it. From subtle to extreme, natural to utterly alien, human to robotic, musical to cacophonous, VocalSynth 2 is a powerful, one-of-a-kind toolkit that any music producer or sound designer working with vocals will get more than their money’s worth from.